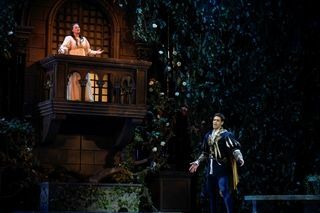 Opéra de Montréal (OdM) brought the curtain down on its 39th season with the THIRD revival of its production of Gounod’s Roméo et Juliette, originally staged here in 1986. This still fresh and sumptuous production by director Tom Diamond and designer Claude Girard featured a strong cast and deft, sprightly conducting by visiting maestro Giuliano Carella. The traditional set comprised the interior of a Renaissance palazzo with a series of wide Roman arches and gleaming marble columns with Corinthian capitals. The set was easily re-configured for the balcony and tomb scenes. Hanging vines in lustrous green from floor to ceiling cradled Juliette’s balcony, and conveniently placed branches allowed the nimble Roméo to scale it twice with ease. The luxurious period costumes in lush velours of red, green and blue provided the perfect foil for Eric Champoux’s backlighting to the various scenes—with blue reflecting joy, and red, of course, strife and death. All the principal singers but one were Canadian. With the plethora of local talent in Quebec, however, one had to wonder why Ismael Jordi was brought from Spain to play Roméo. His tenor was strong, riveting and with just a hint of vibrato. It had a steely edge but could be warm and expressive as he proved in the role’s signature aria “Ah! Lève-toi, soleil”. The chief drawback, however, was his failure to portray Roméo convincingly. Jordi could not (or did not want to) convince us that he was head over heels in love with the ravishing Juliette. He was stiff and lacked ardor. Mostly he struck classic operatic poses as he sang to the ceiling. While singing with his back to Juliette during the balcony scene one could almost feel Juliette willing with all her might for him to look back at her. No such luck. Jordi seemed to be more in love with himself than Juliette. Marie-Eve Munger, on the other hand, threw herself into the role of Juliette. She lit up the stage like a Veronese candle. A native of the north-eastern Quebec town of Jonquière, she has been singing mostly in the U.S. and Europe (where she resides in Paris). Except for an appearance at the 2014 annual OdM gala, this was her opera debut with the company. Her coloratura was fresh, secure and confident and she never failed to nail her high notes. Her “Je veux vivre” was an absolute delight. Munger’s voice should take on more luster and depth with time. I look forward to the day when she finds her perfect Roméo. The production’s other standout was Alain Coulombe as Frère Laurent. His booming but effortless, rich, rounded bass dwarfed the voices of his colleagues in volume. He nicely calibrated it, however, while he was singing with others. All singers acquitted themselves admirably. Special mention must be made of baritone Hugo Laporte as Mercutio who excelled in “Mab, la reine des mensonges”, and the young mezzo Katie Miller as Stephano. Stage director Tom Diamond kept a tight grip on the stage action and excelled in blocking his scenes. The duel sequences crackled with energy and the choruses were riveting. As usual, Claude Webster prepared the chorus well. Giuliano Carella conducted with a light touch and kept up a brisk tempo throughout.